WASHINGTON: Vivek Murthy, the first Indian-American appointed by the Obama regime as the Surgeon General, has been dismissed by the Trump administration to bring new leadership to the vital public health sector. Dr Murthy, 39, has been replaced by his deputy, Rear Admiral Sylvia Trent-Adams, one of the first nurses to serve as surgeon general. “Murthy, the leader of the US Public Health Service Commissioned Corps, was asked to resign from his duties as Surgeon General after assisting in a smooth transition into the new Trump administration,” the US Department of Health and Human Services said in a statement yesterday. “Murthy has been relieved of his duties as Surgeon General and will continue to serve as a member of the Commissioned Corps,” the statement said. Dr Murthy was confirmed as US Surgeon General in December 2014. It was not immediately clear why Dr Murthy was relieved from duty, the New York Times said while noting that employees at the Department of Health and Human Services privately expressed surprise at his sudden departure. 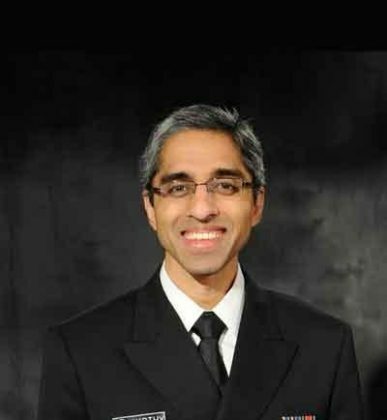 Vivek Murthy, the 19th Surgeon General and the first Indian American to hold this post said in a Facebook Post that it was an honour and privilege to work for this prestigious position. “For the grandson of a poor farmer from India to be asked by the President to look out for the health of an entire nation was a humbling and uniquely American story. I will always be grateful to our country for welcoming my immigrant family nearly 40 years ago and giving me this opportunity to serve,” he said. “(Health and Human Services) Secretary (Tom) Price thanks him for his dedicated service to the nation. Rear Admiral Sylvia Trent-Adams, who is the current Deputy Surgeon General, will serve as the acting Surgeon General and assume leadership of the US Public Health Service Commissioned Corps,” the official statement said. Interestingly, Dr Murthy is the second Indian-American to be fired by the Trump administration from a senior position. The first one was the US Attorney from New York Preet Bharara who was sacked after he refused to resign. “As my colleague Rear Admiral Sylvia Trent-Adams takes over as Acting Surgeon General, know that our nation is in capable and compassionate hands. Thank you, America, for the privilege of a lifetime. I have been truly humbled and honoured to serve as your Surgeon General. I look forward to working alongside you in new ways in the years to come,” Dr Murthy wrote on his Facebook Post. “While I had hoped to do more to help our nation tackle its biggest health challenges, I will be forever grateful for the opportunity to have served,” he said. “The role of the Surgeon General is traditionally to share wisdom with others, but it was I who learned so much by listening to your stories in town halls and living rooms. In a remote fishing village in Alaska, a church in Alabama, an American Indian reservation in Oklahoma, a school in Virginia, and in so many other places, I watched the grit and grace with which our fellow Americans live their lives,” he said. Dr Murthy was confirmed by the Senate by 51 to 43 votes, despite stiff resistance by the pro-gun lobby led by the National Rifle Association. The Surgeon General is appointed for a four year term. At 37, he was the youngest ever Surgeon General. Dr Murthy’s parents are originally from Karnataka, India. He is currently a practicing physician at Brigham and Women’s Hospital in Boston, as well as the Hospitalist Attending Physician and Instructor in Medicine at Harvard Medical School.